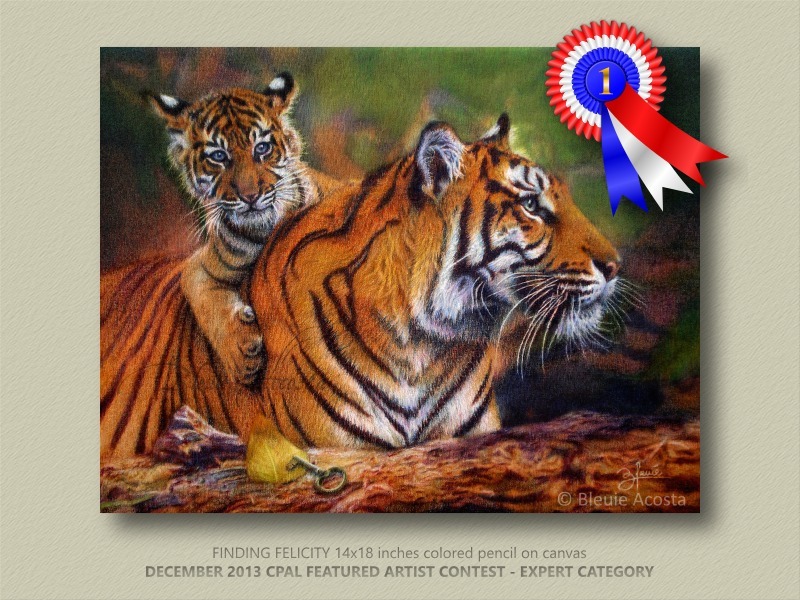 It was a big surprise when I've found out that "Finding Felicity" won in the CPAL Featured Artist Contest. It's my first time winning in the expert category and with a Canson/Bruynzeel award to go along with it. Yay! 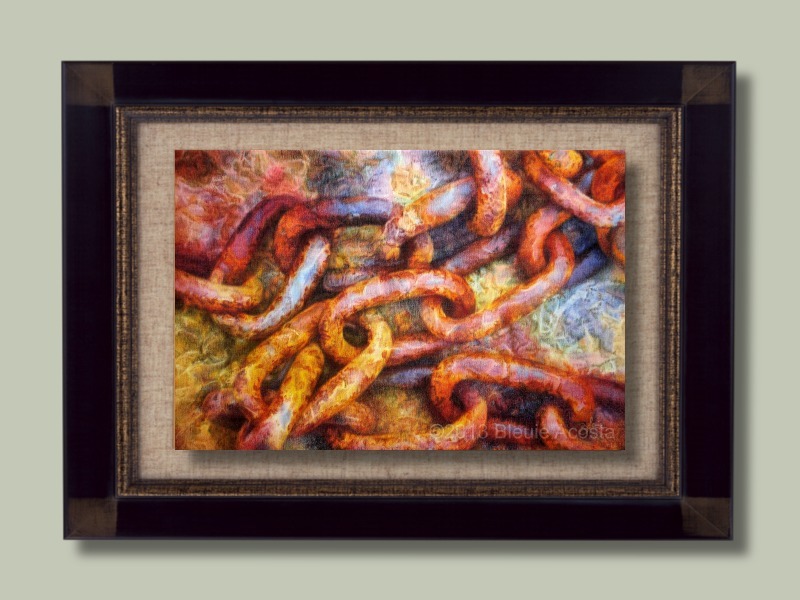 People gaze at an artwork, some in admiration and some in disapproval, yet many are unaware of the difficulties an artist have to endure behind each and every creation. I am an artist and I know that it takes more than just inspiration to create art; blood, sweat, and tears perhaps is more appropriate. To be able to fulfill their passion for art, some artists have to overcome physical, mental, emotional, or financial struggles—of which I have my own fair share. This is a tribute to all artists who, in spite of all the obstacles that bound them, still strive to do what they love even if only within the limits of their abilities and resources. The ambitious project has now come to completion. The whole year of going through the difficulties and overcoming the challenges of working with a large scale colored pencil artwork on canvas was all worth it. I've started with nothing but colored pencils and a dream, in time, I've gained knowledge and experience that broadens my understanding about art and colored pencil. Finishing this is like earning an art degree for myself, a diploma that I never had. I'm having a fabulous time exploring the wonderful world of colored pencils! A Big P-U-S-H! That is what I’m aiming for this year. I have come to know my strengths as well as my limitations and I’m searching for a way to bridge the gap between what I can do and what I wanted to do. I already have ideas running inside my head, the theme and style I have in mind may not be as popular as that of my former works, but if I succeed in pulling it off, then I may have found the answer that have eluded me for quite some time. Big P-U-S-H! A quest to unite two worlds!
. . . keeping my fingers crossed. . .
A few months ago our house was filled with flood waters, today, it's filled with art supplies given by generous people who are more than willing to help out a fellow artist. Some of my CP artist friends from the US contributed to buy me new art supplies and sent them over here. The package came yesterday and I was so excited that I was literally drenched in rain because I was so eager to get them. My deepest gratitude to each and everyone who have made this possible. May God bless you all. I love ice cream. It's great for breakfast at 4am, lunch, dinner, or as a midnight snack, come to think of it, I love ice cream anytime of the day or night. Richard Brown said that a balanced drawing is like a Neapolitan ice cream, it must have a good balance of Light, Dark, and Mid tones. 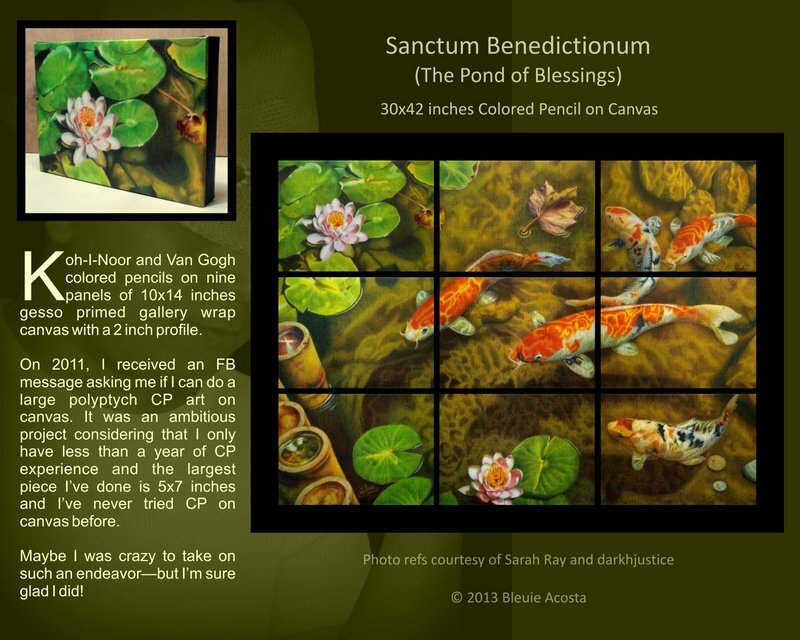 Using a wide range of tonal values, the right balance of highlights, shadows, and mid tones create the illusion of depth and makes an artwork more visually appealing. My first CP drawing was more like vanilla and strawberry (light and mid-tone) lacking in contrast and depth. The tiger done, on the other hand, shows a big difference with the right amount of chocolate (dark). A basic kit containing a set of colored pencils, paper, sharpener, and eraser is enough to begin with and create an artwork. Everything else is optional and can be added later as skills progress. This is a Japanese rendition of my name BLEUIE made by my friend, Carmen Harada, a highly skilled calligrapher and also an accomplished artist in pencil and watercolor. Check out more of Carmen's beautiful works on carmenharada.deviantart.com.